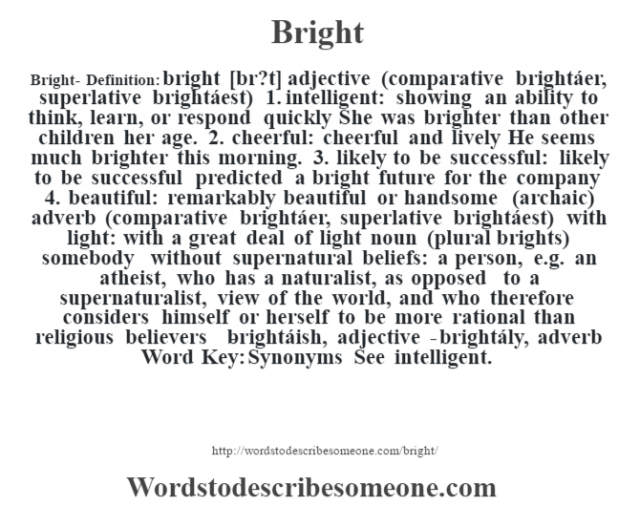 Bright- Definition:bright [br?t] adjective (comparative brightáer, superlative brightáest) 1. intelligent: showing an ability to think, learn, or respond quickly She was brighter than other children her age. 2. cheerful: cheerful and lively He seems much brighter this morning. 3. likely to be successful: likely to be successful predicted a bright future for the company 4. beautiful: remarkably beautiful or handsome (archaic) adverb (comparative brightáer, superlative brightáest) with light: with a great deal of light noun (plural brights) somebody without supernatural beliefs: a person, e.g. an atheist, who has a naturalist, as opposed to a supernaturalist, view of the world, and who therefore considers himself or herself to be more rational than religious believers -brightáish, adjective -brightály, adverb Word Key: Synonyms See intelligent.